Zoe “Rita” Nahatis, 81, of Manchester-by-the-Sea, sister of the of Christos G. Nahatis and the late Michael G. Nahatis both of Manchester-by-the-Sea, died Wednesday afternoon August 4, 2010, peacefully in her cherished home. Born in Beverly on May 10, 1929, she was the daughter of the late Constantine and Johanna (Alexopoulos) Nahatis. She was a life-long resident of Manchester by-the-Sea. Miss Nahatis was a graduate of Manchester’s Story High School Class of 1947, and completed certification programs for hair styling at Mansfield Beauty Academy and for secretarial skills at Bryant & Stratton Commercial School, both in Boston. She was employed at Filene’s state of the art beauty salon in the flagship store in Boston as a hair stylist. She transferred to newly opened store at Northshore Shopping Center in 1957, where she worked for over 30 years, advancing to the position of executive assistant to the store’s general manager. She built a legacy of outstanding customer service and formed a life-long friendship with the other charter employees in the Finoshor's (Filene’s North Shore) Club. Miss Nahatis also worked for Parker Brothers and Kaiser Systems, Inc. as a receptionist. She was an active member of the Assumption of the Virgin Mary Greek Orthodox Church of Ipswich, serving as a Sunday school teacher and a member of the Melissa Society. She was a charter member of the Pi Epsilon Sigma, a charitable, fraternal and social organization in Manchester, serving a term as its President. 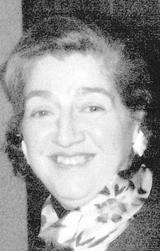 Miss Nahatis enjoyed gardening, her unparalleled view of picturesque Manchester harbor, the New England Patriots, driving the scenic route- whether up the coast to New Hampshire or down the eastern seaboard to Florida, and traveling to Greece to visit many relatives and her family’s village of Langadia. She was extremely proud of her Hellenic heritage. Her true passion was reserved for her family, as a loving, dedicated care-giver to her mother and aunts, as a devoted sister, as a friend and co-conspirator with her cousins, and as an aunt and godmother who both supported and celebrated the accomplishments of her nieces, nephews, and godchildren. Surviving her in addition to her brother Chris are her sisters in-law Alice M. (Mrs. Christos G.) Nahatis and Helen C. (Mrs. Michael G.) Nahatis, nephew Charles G. Nahatis and his wife Stella, nieces Stephanie Senecal and her husband Daniel, and Christina Nahatis Barrett all of Manchester by-the-Sea, nephew Arthur C. Nahatis of Midlothian, TX, niece Johanna Kadra and her husband Malcolm of Hamilton, nephews Alexander M. Nahatis and his wife Lisa of Danvers, Dean M. Nahatis of Maple Shade, NJ, Harry M. Nahatis of Brookline, her cousin Nena Vasilas of Athens, Greece, and many beloved cousins, grand-nieces, grand-nephews, and godchildren. Her funeral service will be held Saturday August 7, 2010 at 10 am in the Assumption of the Virgin Mary Greek Orthodox Church, 6 Lafayette Road, Ipswich. Family and friends are invited to attend. At Zoe’s request, there will be no visiting hours. Burial will be in Rosedale Cemetery, Manchester by-the-Sea. Arrangements are under the direction of the Whittier-Porter Funeral Home of Ipswich. In lieu of flowers, memorial donations may be made to the Assumption of the Virgin Mary Greek Orthodox Church, P.O. Box 6, Ipswich, MA 01938.